Bluebird Trails are open for business! Thanks to the many people who install and tend nesting boxes, Bluebird populations are growing. You can help and have a great time too! We are helping keep Bluebirds common at Merrimac Farm and Chinn Park. We have 14 nesting boxes at Chinn Park, 16 at Merrimac Farm and 9 at Veteran's Park. Bluebird Trail volunteer monitors check the boxes to make sure all is well and record information about what's happening in each nesting box. Bluebirds are a dramatic environmental success story. In the 1960's and 1970's, habitat losses, pesticides (including DDT) and competition from introduced species resulted in the loss of suitable nesting sites and decreased populations of Bluebirds. A few folks who remembered the Bluebirds took direct action and provided nest boxes. The word spread and lots of people began to put out nest boxes and brought Bluebirds back to our region and beyond. Not all nesting boxes provide a safe refuge for Bluebirds. Bluebirds have many predators, including snakes, raccoons, ants, squirrels and cats. Also, other birds, such as House sparrows, starlings, wrens, chickadees, and tree swallows, compete for available nesting sites. Successful nesting boxes are constructed to protect Bluebirds from predators and discourage competition from other species. Snakes love to eat tasty bluebird eggs and young birds. Adding a baffle made of round metal ducting material on the mounting pole prevents snakes from slithering up the pole and entering the box. It also protects the nesting box from climbing cats, raccoons and squirrels. Ants can be another problem… you sure don’t want to check on the progress of newly hatched bluebirds and find them covered with ants! Covering a portion of the mounting pole (in a spot that won’t bother the Bluebirds) with a slippery or sticky substance should do the trick. There’s lots of recommendations on what to use, from vaseline to Teflon spray to Tanglefoot, a commercial insect barrier. A good bluebird nesting box should try to mimic a natural cavity.. unpainted and made from untreated wood (treated wood contains toxins). It should be well ventilated, watertight, and have drainage holes… but never a perch, which attracts Sparrows and Wrens instead of Bluebirds.The round entrance hole should be 1 1/2 inches. The small hole will keep Starlings away but you will still have to be on the watch for House Sparrows, which destroy Bluebird eggs and kill young Bluebirds. Bluebirds depend on the availability of suitable cavities in open habitats with sparse ground cover and little or no understory. Open areas that border woodlands are good sites for bluebird nesting boxes… backyards, golf courses, churches, school yards, cemeteries and more. Hollow branches, tree snags, old woodpecker cavities, fence posts and nesting boxes are all preferred sites for Bluebird nests. Male bluebirds scout for housing in very early spring. By mid-March or early April they will have selected a few options to show their mate, who will make the final choice. Generally, Bluebirds lay four to seven eggs. These hatch in approximately 14 days. 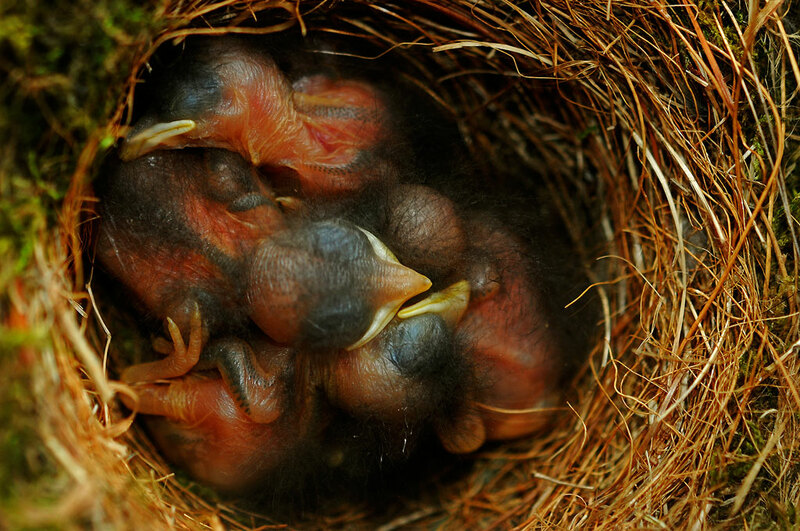 About 14 days after hatching, Bluebirds begin short flights and leave the nest soon after. In Virginia, Bluebirds produce two or three broods each year. Both parents feed and care for the young. During the summer, Bluebirds eat grubs, caterpillars, beetles, grasshoppers, crickets, and other insects. In late fall and winter, they depend on wild fruits, such as crabapples, poison ivy berries, sumac, elderberries, and cedar berries.